The last time Clark and Pahrump met was on September 12 and Clark won that game 2-1. In that game, the Lady Trojans underestimated Clark. The Chargers (8-5 overall, 6-4 Sunset League) had hoped to repeat that victory on Tuesday on the Trojans (9-4, 6-3) home turf, but they were denied 1-0. 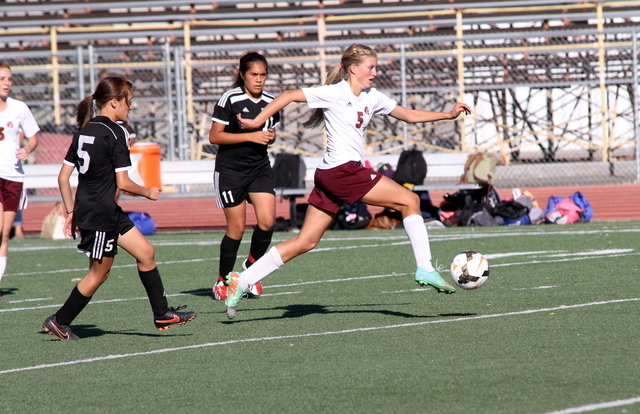 The one Pahrump goal was made by senior Amy Estrella who plays wing. She was assisted by Jamie Murphy. Estrella said she received a perfect cross by Murphy as she came down the right side of the field just 16 minutes into the game. Pahrump Valley is slowly climbing up the standings and with the latest victory find themselves alone in third behind Sierra Vista (7-2-1, 7-2) and Faith Lutheran (10-4-2, 7-1). The Trojans have a big chance to pick up some ground against Faith because the Crusaders dropped a game against Spring Valley 4-2. Pahrump had three losses early on in the season as they worked feverishly to iron out midfield problems and injury issues early on since playing Clark last. Trojans Coach Pam Larmouth believes that her position issues have been solved. “Our midfield played much better against Clark today than they did the last game. And that was because we put people in there who had never played midfield and they didn’t know their positions or what to do,” she said. Larmouth said her team has played more aggressively since the Faith game. The Trojans face the Warriors (2-7-2, 2-7) next and don’t expect them to just lay down and give up. The game was played on Thursday past deadline. The Trojans are at Spring Valley (4-4-1, 4-4-0) on Wednesday next week at 3 p.m.
Trojans boys’ soccer played the second place team, Clark, (9-0-2, 9-0-1) on Tuesday and lost 7-0 in the second half. Pahrump Valley (4-10-2, 1-8-1) has lost its last two games since the second half of the season started. In the last four games before the latest game, the team lost only by one point. In the Clark game, the Trojans had a chance to win it. The score was 0-0 at the half. Trojans Coach Don Boulden feels his team is not playing as a team. “We have too many players playing as individuals,” Boulden said. He added the team doesn’t listen to what the coaches are telling them and the players do their own thing on and off the playing field. 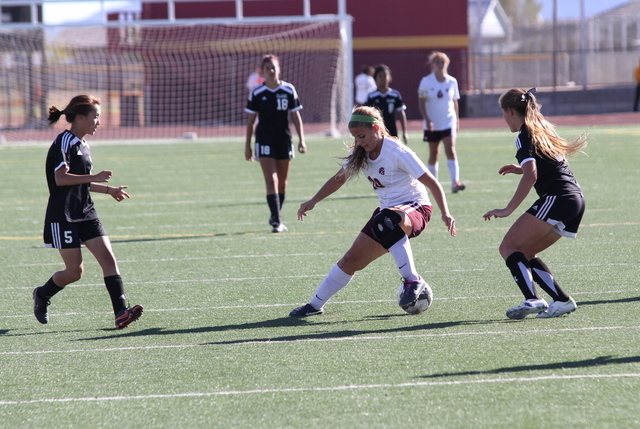 Pahrump played against Western (11-4-1, 10-1-0), which was past deadline. The team is at Adelson School (1-9-1, 1-9-1) on Tuesday at 4:30 p.m.